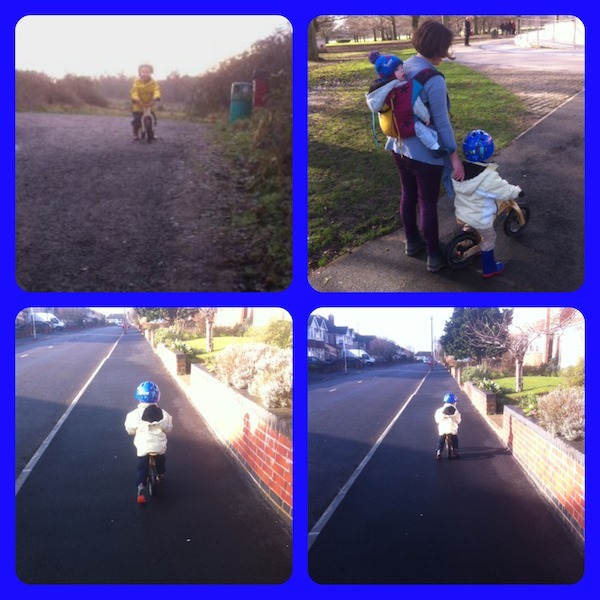 A while ago I blogged about how Andrew loved his balance bike and was very good at riding it. Well he still does and still is, but for Christmas he was very kindly given a big boys’ pedal bike by Granny and Grandad. We’d noticed that he was getting quite big for his balance bike – the Early Rider lite – which he’s been riding for over a year, since just before his 2nd birthday. The saddle is on the highest position and his feet are well and truly touching the ground. At about the same time, he’d been noticing the big girls and boys of Cambridge riding on their pedal bikes, and decided that he too wanted to have a go. So we suggested to him that he wait for Christmas and see what surprises might come his way. And he wasn’t disappointed. Well, not until he got on it, tried to pedal off and fell off! I think he thought he’d just be able to do it as amazingly as he’d been doing his balance bike. That put him off a little, so we encouraged him to get on it step by step, doing just a few minutes on the drive with it each day and using his balance bike for longer trips out. We’d heard a tip that not putting the pedals on straight away helps kids get used to the new, heavier, bigger bike, whilst still acting like they’re riding a balance bike. It was also just a tad too big for him at first. But without pedals he was happy to sit on the cross bar and push himself around with his feet, just like he’s used to. Then one day a couple of weeks ago, when out riding (i.e. pushing) in the cul-de-sac with Daddy, he asked to have the pedals on. So they were quickly whipped on before he had chance to change his mind, and off he went, with Daddy holding the back of the saddle as he pedalled. 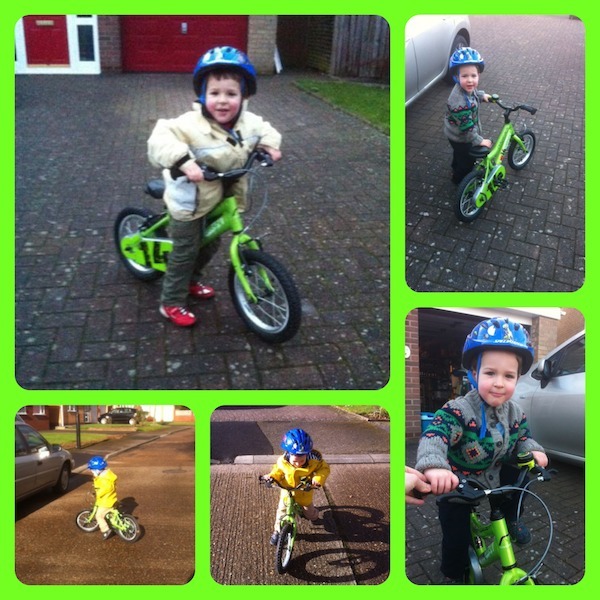 He did really well, and over the next week, with more practice, he got even better at pedalling. So much so that when I took him out with his new bike one afternoon this week, all I had to do was lightly hold his coat at the shoulders – he was providing all the balance himself and I could easily have let go, but he liked the security of feeling my hands on him, even if just a little, because when I took them off for a second he screeched at me to put them back! And he didn’t fall off in that time. I’m now trying to convince him that he really doesn’t need us to help at all, we’re not doing anything vital, but I think it’ll take a little more confidence. I’m sure one day soon though, I’ll just let go and he won’t notice, then he’ll pedal off into the distance. I’m already finding it hard to keep up with him on his balance bike – jogging after a 3 year old on a bike with a 15 month old on my back in the sling is a great workout – but once he’s off on his pedal bike, I think his speed with only be rivalled by me on my bike (which, incidentally, is in storage since we moved – there’s less need for it in Coventry than in Cambridge). Despite the temporary lack of confidence, overall I think the skill of balance that his first bike has taught him has been key in him learning to ride a pedal bike so young. We’d heard that a balance bike was a good idea in this respect, but now we’re seeing for ourselves that it really is true. I remember learning to ride a bike without stabilisers, and I was quite a bit older than he is now. He will never even have been through the stabiliser stage, going straight from balance to pedal bike. I would definitely recommend this if you’re keen to get kids riding young. Now we’ve just got to get Joel on the balance bike and we’ll be off on family bike rides before we know it! Wow – that’s amazing how quickly he’s come along. We haven’t had a balance bike for either of mine but my daughter came off stabilisers pretty quickly, my boy on the other hand is stuggling with pedals and doesn’t have the same determination. Looks like a balance bike really is a good way to start riding a bike. Yes I’m sure a lot of it is down to personality and how determined and confident they are. I’m sure I was less confident than plenty of kids to get bike riding. I’m glad we did the pedal bike for him though, it’s made so much sense. Well done to Andrew, he’s doing so well riding his big peddle bike. Like you I think the balance bikes are a fantastic way for the children to build their confidence and get the hang of managing a two wheel bike. Thanks for linking up and sharing his outdoor bike fun with Country Kids. We found the balance bike to be an excellent precursor to a real bike, our 4yo was able to ride straight away as he’d been great on the balance bike. The 7yo hadn’t really used the balance bike and we ended up turning his big bike into one by taking the peddles off 🙂 The wee girl is getting a balance bike for her birthday in a few weeks! Well done Andrew! I had heard that balance bikes were really good for helping children to learn to ride “proper” bikes – only it was too late for our boys. Well done your Andrew! I think it’s only recently that there has been more awareness of balance bikes. We lived in Cambridge and saw loads of kids on them, it’s a cycling city. Wow, he’s so confident and capable on his bike. The Boy could never get to grips with the balance bike he had, I think it was too heavy. He is too tentative a boy to cope without the security, but he is very confident with stabilisers. 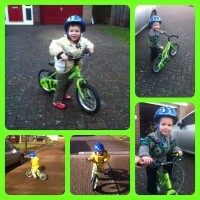 I’m sure it won’t be long before he’s pedalling independently, however you’ll need to get your bike out or run faster! Oh good to know how he’s getting on. N had his balance bike at 2 as well, and has been riding that for a year. We do need to raise it up, but I was thinking the summer, when he can learn to ride a proper bike on the grass (as we’ve got gravel on the farm – not good for riding on). So going on your son’s progress, N will definitely be ready by then.